The Greater Idaho Falls area is situated along the Snake River at the western edge of the Rocky Mountains. This community is a gateway to many popular outdoor destinations, including the Grand Teton mountain range, Henry's Lake, the Saint Anthony Sand Dunes, and the world's most famous park, Yellowstone. Greater Idaho Falls has the best features of living in a big city, while maintaining the charm of a close-knit small town. One of the highlights of Idaho Falls is the Greenbelt, a park that surrounds the banks of the Snake River. With plenty of room to bike, walk, and run, the Greenbelt is for everyone. 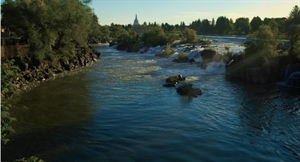 Idaho Falls is also seated within a short distance of many outdoor activities. Nearby mountain ranges and forest areas are great for hiking, horseback riding, mountain biking, and more. Fishing enthusiasts can find lots of nearby places to cast a line, most notably at Henry's Lake, a prime paradise for fly fisherman. For those who are less outdoors-inclined, Idaho Falls also features shopping, three movie cinemas, the Museum of Idaho, and the wide variety of plays and productions from the Idaho Falls Arts Council. The arts community is alive and well in Idaho Falls, with features such as the Museum of Idaho, the Idaho Falls Arts Council, and the Idaho Falls Symphony. The Museum of Idaho features several new exhibits each year alongside its standing exhibit on Idaho's history. The Idaho Falls Arts Council is situated in downtown Idaho Falls in the Willard Arts Center, with a wide span of musicals, plays, and productions in the historical Colonial Theater, and featuring the works of local artists in the Carr Gallery. The Idaho Falls Symphony features the most talented musicians in all of eastern Idaho and entertains many a happy music lover with each season of classical performance. Greater Idaho Falls features a regional airport that accommodates travel to many places in the intermountain west. The Salt Lake City International Airport is also within 3 hours of the community for more air travel options. There are also shuttle services including the Salt Lake Express, which travels to and from Salt Lake City and other cities every day, and TRPTA, a shuttle service that features demand response and has four routes within the Idaho Falls city limits. Idaho Falls has some of the most talented physicians and nurses in the state of Idaho. Eastern Idaho Regional Medical Center, commonly known by EIRMC to residents, is the third largest employer in the county and serves 300,000 people in the area. Mountain View Hospital also serves the people in eastern Idaho, most notably with their RediCare urgent care centers. There's no shortage of specialists in Idaho Falls. Specialized needs of nearly any kind can be serviced here, and often within a short distance of the hospital. Cancer treatment, spine surgery, physical therapy, dermatology, and much more are all served right here, with no need to travel a long distance. Jan 12.2 F° 20.6 F° 29.1 F° 1.2 "
Feb 16.5 F° 26.2 F° 35.9 F° 1.0 "
Mar 24.9 F° 36.0 F° 47.1 F° 1.2 "
Apr 31.4 F° 44.9 F° 58.4 F° 1.2 "
May 38.8 F° 53.2 F° 67.6 F° 1.9 "
Jun 46.0 F° 61.8 F° 77.6 F° 1.2 "
Jul 51.3 F° 68.6 F° 86.0 F° 0.7 "
Aug 49.7 F° 67.7 F° 85.6 F° 0.9 "
Sep 41.1 F° 58.0 F° 74.8 F° 0.9 "
Oct 31.9 F° 46.5 F° 61.0 F° 1.1 "
Nov 22.9 F° 32.8 F° 42.6 F° 1.1 "
Dec 13.1 F° 22.0 F° 30.9 F° 1.2 "
Summer months in Greater Idaho Falls are often mild, with sunny days with temperatures between 70 to 90 degrees. Fall and winter months are cold in Idaho, with moderate to heavy snowfall and strong wind chill. Volunteer opportunities are needed in many organizations. Our visitor's center is always looking for volunteers.